Dear Dave, Should I buy a house for my car collection? I have two vintage cars that we love to drive in the nice weather and I enjoy working on in the winter. The kids are gone and I'm wondering if it is time to buy a house to accommodate our passion? I might be the wrong person to ask ... as soon as we bought a house with a garage, we bought a 1973 Triumph TR6 and I'm glad it's close by to go for a spin or to fix something. 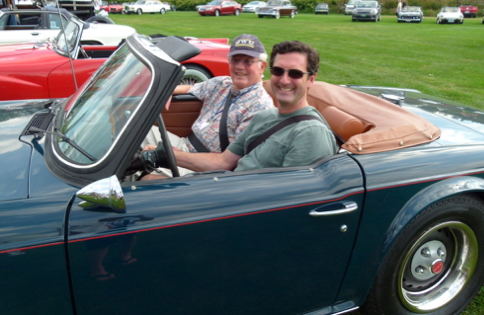 Having fun with my Dad at the British Invasion, Stowe, VT.
Several of my clients enjoy collecting vintage or specialty cars and have different spaces for showing and working on them. Some appreciate the convenience of having their cars on their property for easy access to go for a drive or to tinker under the hood when they want to get their hands dirty. Some clients own separate, fully stocked garages suitable for any kind of car repair. Some have offsite garage space for storage purposes only.
. When and how often do you want to use your car?
. Do you need an area to work on your car(s)?
. Would you like space to host a work session with friends?
. Do you collect car memorabilia that you would like room to display?
. Is convenience important to you in terms of accessing the car for a drive? Your answers to these questions will help you decide if it is time to buy a house to accommodate your passion. To get an idea of a car collector’s dream property, click here to explore this home for sale in Warwick, RI. Click here to request a listing of homes for sale, with three or more garage spaces, in your favorite neighborhoods.